Movenpick Hotel Jumeirah Beach have just launched their latest brunch concept. 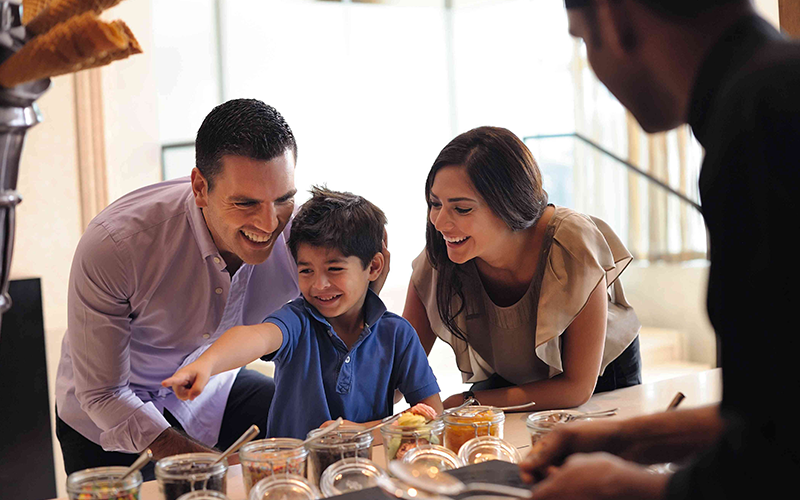 Called “The Movenpick Market Brunch” it will take place every Friday from 12.30pm – 4pm. The brunch takes place across two restaurants at the hotel. Talk (a lively and vibrant family-friendly restaurant) and Soul (a more sophisticated setting, with both indoor and outdoor seating). There’s also live jazz music at the brunch. The live cooking stations at the brunch are influenced by different markets from around the world. Diners can expect freshly made pizza and pasta dishes, along with traditional curries, Arabic and East Asian flavours. There’s also a buffet, crammed with delicious sushi, seafood and a traditional British roast dinner. The laidback family-friendly brunch also has a separate “Power Bites” menu available to the youngest diners at the table. There’s also a separate children’s corner and kids’ play area at the brunch to keep kids entertained. For dessert, there’s wide range of ice cream, chocolates, pastries and cakes. The hotel has its own chocolate and coffee range, which the hotel’s chefs use in many of the desserts on offer at the Market Brunch. Details: Prices start at AED 299 for a soft drinks package, to AED 399 for free flowing beverages. Children aged 6-12 years-old can enjoy a 50% discount, and children under 6 dine free. For reservations and more information, call 04 449 8834 or email at Hotel.Jumeirahbeach.FB@movenpick.com for more information visit Movenpick Hotel Jumeirah Beach. If you enjoyed this article, you may also like this story on Russo’s 50% discount. Previous Post&LeftArrow; Previous Russo’s Dubai are offering a fantastic 50 percent off deal for one week only!